On your paws, get set, go! Hardcover, 160 pages, 12.5 x 18.7 cm, 4.9 x 7.4 in. Little Wolf is on holiday on an island. But on the very first day his master is taken so badly ill that a helicopter has to transport him back to the mainland. 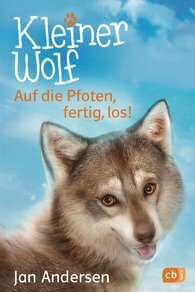 In all the turmoil nobody remembers Little Wolf. He is now all alone on the island, and no matter where he goes, he is always sent away. Most of all he gets into trouble with a scruffy dog who behaves as if the island belonged to him alone. Then one day Little Wolf meets the two children Emma and Leon, and they are so nice to him that he immediately feels he can trust them. All he needs to do now is to get them to take him home with them and help him find his master!